We may safely leave John Bull and Jacques Bonhomme, for a while, to their rejoicings at the "glorious victory" of the Alma and their anticipations of the fall of Sevastopol. The war on the Danube and in the Crimea, whatever importance it may have in the eyes of the allies and of the united Middle Class Liberalism of Europe, has very little weight, as far as Russia is concerned. The center of gravity of that country is in no wise affected by its possible results; while a defeat in the Crimea and forced retreat of the allies would cripple their land operations for a considerable time, and give them a moral check to recover from which would require their utmost exertions. Some authentic reports of the distribution and late movements of the Russian forces have lately come to hand, and it may be well to sum them up in ' order to show how little, comparatively speaking, of the Russian force is as yet engaged, and what the remainder is expected to perform. I. THE GRAND ACTIVE ARMY— 2 corps of élite, Guards and Grenadiers, containing 76 battalions, 92 squadrons, 228 guns. 6 corps of the line, —"—, 300 battalions, 192 squadrons, 672 guns. 3 Cavalry corps, —"—, 176 squadrons, 96 guns. Total, 376 battalions, 460 squadrons, 996 guns. II. SPECIAL CORPS— Finland corps, 12 battalions. Caucasian corps, 55 battalions, 10 squadrons, 180 guns. Reserve Caucasian corps, 36 battalions, 2 squadrons,—guns. Caucasian line, 47 battalions,— squadrons,— guns. Total, 175 battalions, 12 squadrons, 180 guns. III. COSSACKS AND OTHER IRREGULARS— About 700 squadrons, 32 battalions, and 224 guns. IV. RESERVES— 1. About 50 battalions of Interior Guards, besides invalids, penal companies, 77. 2. Reserve of the grand army, or 4th, 5th and 6th battalions of Guards and Grenadiers, 5th and 6th battalions of the line, viz: three battalions for 24 regiments, and two battalions each for 72 regiments, or in all, 216 battalions. 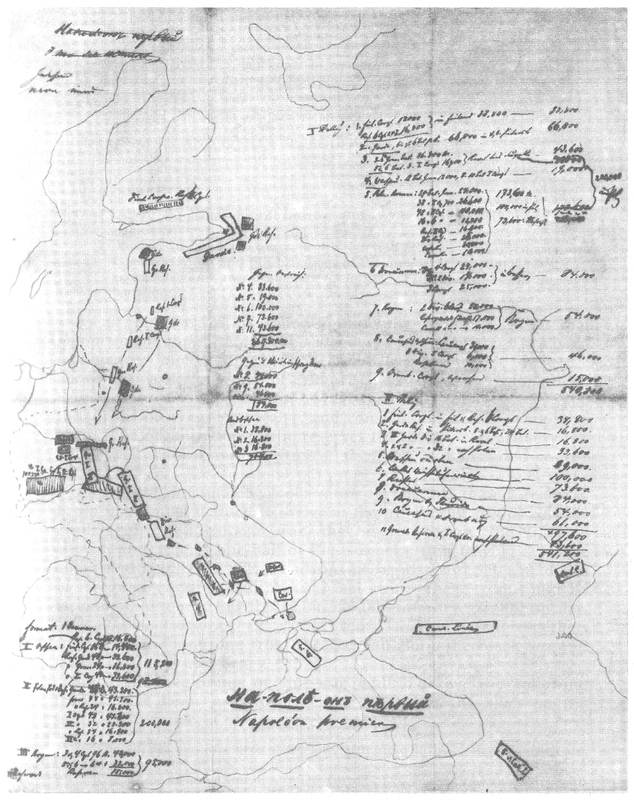 A page from Engels' preparatory material for the article "The Military Power of Russia"
As all the reserves are called in and fully organized, so far that the formation of the 7th and 8th battalions of each regiment has been commenced out of the lately decreed levy of 300,000 men, the above 216 battalions may be comprised in the grand total, which would give 726 battalions, 472 squadrons of regular, 700 squadrons of irregular cavalry, and considerably above a thousand guns. The organization of the reserves for cavalry and artillery not being well known out of Russia, they are not included in the above. This array, fortunately, looks more formidable than it really is. From it we must deduct, to arrive at the number of troops actually available for a European war, the Siberian corps, the Internal Guard, and at least one-half of the Cossacks; thus leaving available about 650 battalions, 472 squadrons of regular and 350 squadrons of irregular cavalry, with about 1,200 guns. These troops may be estimated, at a very low figure, at 520,000 infantry, 62,000 cavalry, and 30,000 Cossacks, or rather more than 600,000 together, spread on the long line from the Caspian along the Black Sea and Baltic to the White Sea. The 3d, 4th and 5th corps of the line, with some of their reserves, which are, however, mostly still on the march. The whole of the three Caucasian corps. The two divisions (two-thirds) of the first corps of the line, without reserves. A portion of the third cavalry corps (dragoons) in the Crimea. This makes a total of about 240,000 men, before entering on the campaign, but now reduced to 184,000 men at the outside, of whom 84,000 may be taken as the strength of the army in Bessarabia, 54,000 in the Crimea, or marching toward it, and 46,000 in the Caucasus. Making all together about 575,000 men, which, with the Orenburg Corps (at Astrakhan), the Reserve Cavalry Corps, and the detachments of the White Sea and others, comes up to the number stated before of the grand total. Of the troops in Poland, about 30,000 were on the march, about 20,000 garrisoned Warsaw, about 100,000 occupied the right bank of the Vistula, in the late Kingdom of Poland, and about 80,000 remained as a reserve in Volhynia and Podolia, on the Bug and Dniester. Thus the main bulk of the Russian army, and among them the crack regiments of Guards and Grenadiers, was concentrated on a line from St. Petersburg to Chotin, or along the western frontier of the Empire. But these positions did not appear significant enough. The Grenadiers left Revel, to be replaced by a division of Guards, and with the other two divisions of Guards marched off to Poland, the latter four battalions or regiments strong, leaving only the 5th and 6th battalions in Petersburg. Thus the army of the West was increased to above 270,000 men, and the greater portion of the three Reserve Cavalry Corps, which have as yet not been engaged at all, are marched off to join them; this will bring the army of the West to some 300,000 men. Now the positions are changed. The 100,000 men, occupying the south-eastern portion of the Kingdom of Poland, have crossed the Vistula and taken up a position along the Austrian frontier. The 80,000 men have advanced from Volhynia into Poland, and continue the line along that frontier. Guards, Grenadiers possibly the cavalry corps, when they arrive take a central position to the rear. During the winter more troops can be spared from the ice-bound Baltic. By May the new levies, forming the 7th and 8th or new battalions of the different regiments, or 192 battalions in all (130,000 to 140,000 men), will be so far drilled as to replace them. There is no doubt, then, that Nicholas cares comparatively little what happens to the south of his Empire, so long as he can concentrate above 300,000 men in the splendid strategical position of Poland. And a splendid position it is. Driven in like a wedge between Prussia and Austria, it outflanks both, while it is protected by the strongest means of resistance which art and nature combined can produce. Napoleon knew the military importance of the country inclosed by the Vistula and its affluents. He made it his base of operations for the campaign of 1807, until he took Danzig. But he neglected permanently to fortify it, and paid dearly for it after the retreat of 1812. The Russians, especially since 1831, have done what their predecessors in power omitted to do. Modlin, (Novo-Georgievsk), Warsaw, Ivangorod, Brzesc Litewski form a system of fortifications stronger, in its strategical combination, than any other in the world. This system offers a position in which a beaten army may defy double its numbers as long as it has plenty to eat; and to cut off a whole country from all communications is a thing that has not yet been attempted. This whole complex system of fortresses, says a German military writer who knows the country, indicates even more an aggressive than a defensive spirit. It is planned not so much to maintain the ground on which it stands as to serve as a base for offensive attacks toward the west. And there are people who believe that Nicholas will sue for peace if Sevastopol be taken! Why, Russia has not played one-third of her trumps yet, and the momentary loss of Sevastopol and of the fleet is hardly felt at all by the giant to whom Sevastopol and the fleet were but a plaything. Russia knows full well that her decisive action does not lie along the sea shores or within reach of debarking troops; but on the contrary, on the broad interior of the Continent, where massive armies can be brought to act concentrated on one spot, without frittering away their forces in a fruitless coast defense against evanescent enemies. Russia may lose the Crimea, the Caucasus, Finland, St. Petersburg and all such appendages; but as long as her body, with Moscow for its heart, and fortified Poland for its sword-arm, is untouched, she need not give in an iota. The grand actions of 1854 are, we dare say, but the petty preludes of the battles of nations which will mark the annals of 1855. It is not until the great Russian army of the West, and the Austrian army come into play, no matter whether against each other or with each other, that we shall see real war on a large scale, something like the grand wars of Napoleon. And, perhaps, these battles may be the preludes merely of other battles far more fierce, far more decisive the battles of the European peoples against the now victorious and secure European despots. This article is entered in the Notebook as "Dienstag. 17. Oktober. Russische Kriegsmacht en général.— Belagerung von Sebastopol". Apparently, the Tribune editors omitted the part on the siege of Sevastopol. John Bull and Jacques Bonhomme were nicknames given to the English and French.